I love being able to travel and experience other places of the world. 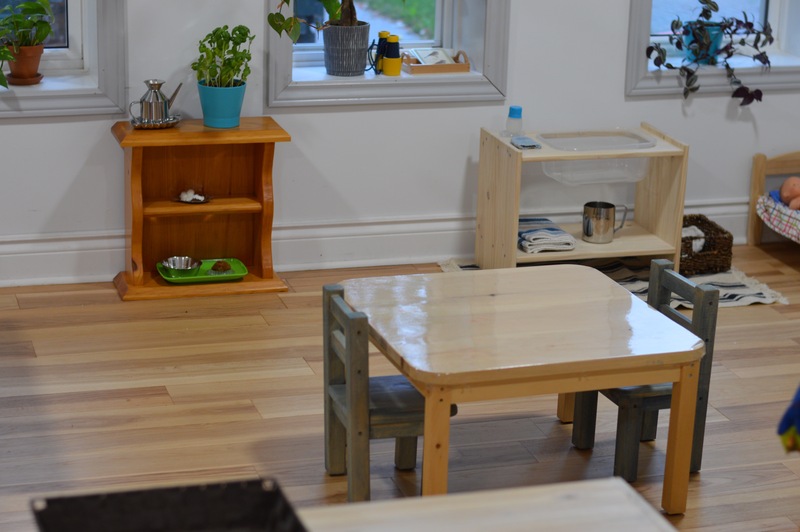 I also love being able to experience new Montessori environments, although often times I find them missing something. I suppose it comes from seeing so many over the years and being so passionate about the pedagogy. I just have a very high bar. However when a new Montessori Nido (Infant/Toddler Environment) is in your hometown, you simply can’t pass up the opportunity to go view it. The Nest which opened in January is absolutely stunning. 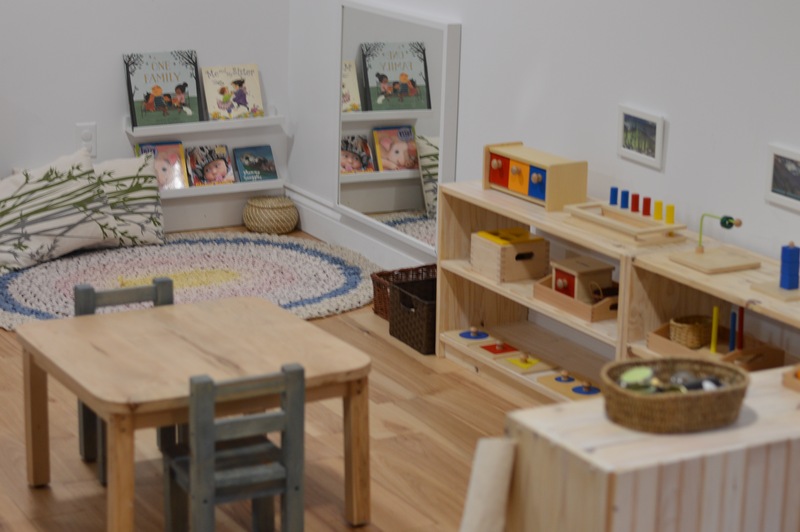 It’s well lit with natural light, thoughtfully laid out and full of gorgeous custom made infant/toddler furniture. Sometimes in Nido’s, that prepared, clean aesthetic that is found in the older classrooms is missed. It’s not intentional. 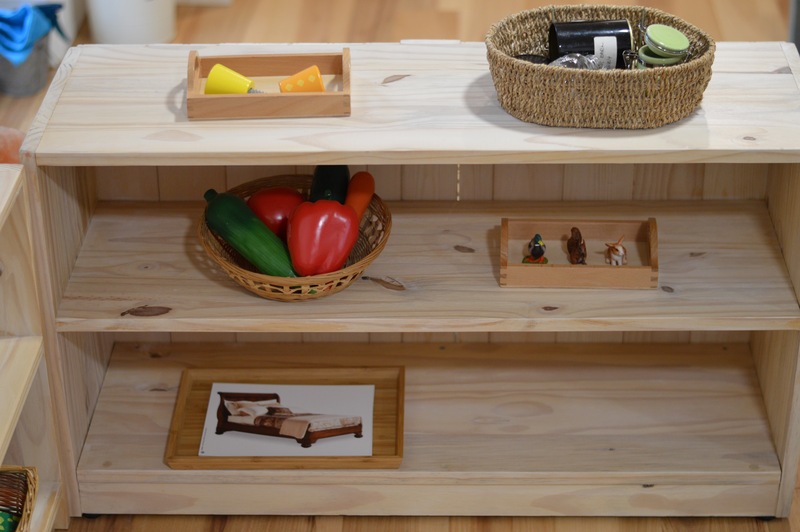 It’s simply that it’s extremely difficult to take the miniature of the 3-6 classroom and shrink it again for the 0-3. This wasn’t the case here. It’s as if the staples of the 3-6 classroom were perfectly shrunk to scale. Everything from the tiny cubbies to the Care of Environment area was well thought out, carefully prepared and beautifully executed. 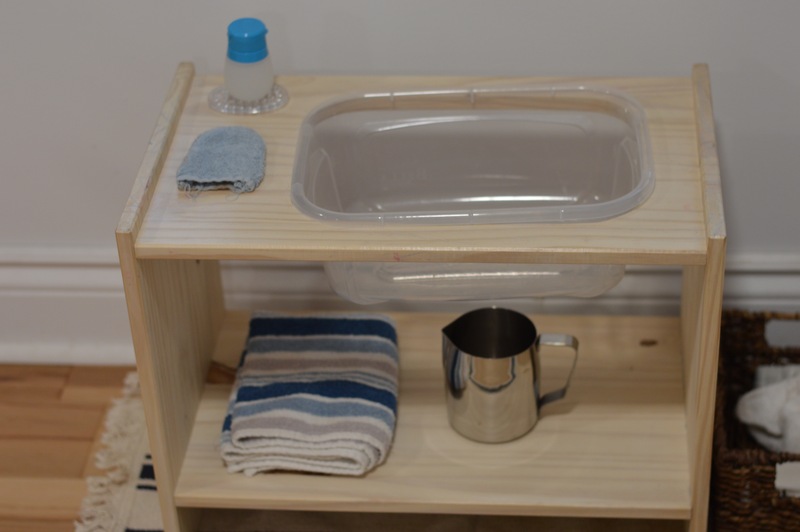 Even the micro sized hand washing station made me smile as it is the exact shelf I use in my 3-6 classroom for my calendar work. 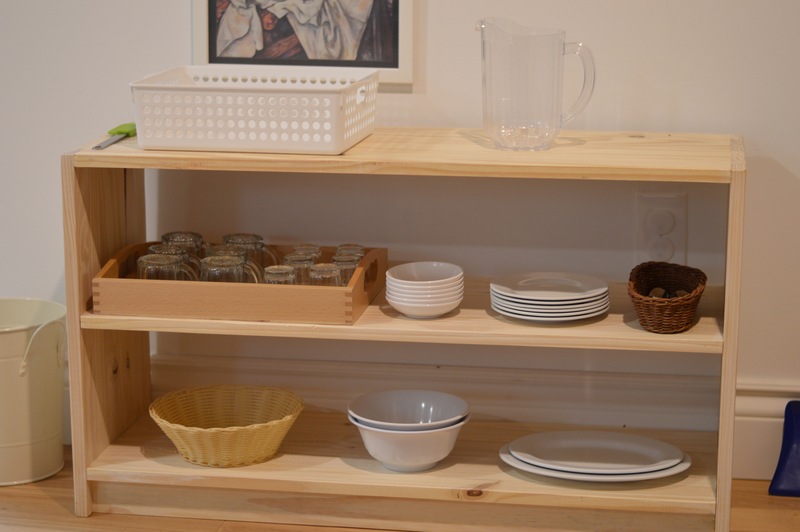 Of course when the custom shelves look this inviting, a Montessori child can’t help themselves. They simply have to roll out a micro sized work mat and set to work. 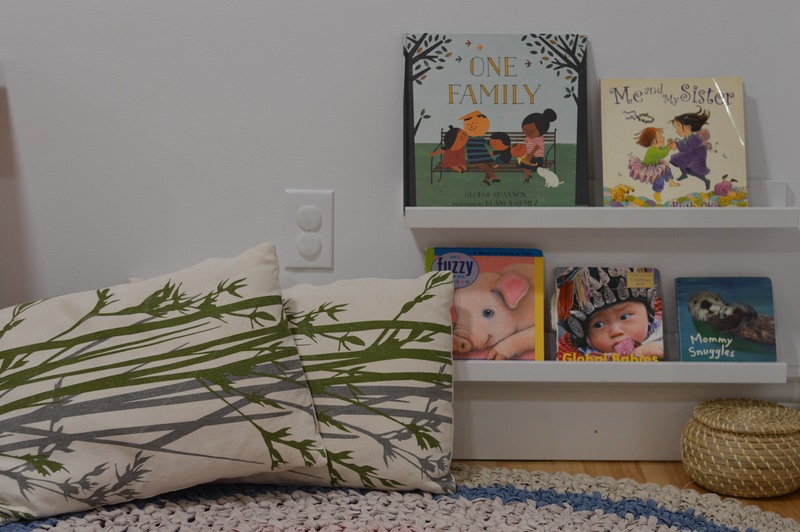 Quentin gravitated toward the things he himself enjoyed not all that long ago, such as the coin sorting box (shown on our home shelves here). He moved around the classroom with the excitement he shows in his own 3-6 class. He asked why the fish tank had a bridge, a reasonable question from a boy who has spent his entire life in the literal, logical world of Montessori. There used to be a snail. 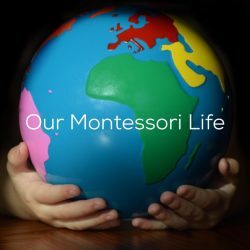 Alison is a Mom of 3 Montessori kids aged 7, 4 and 2.5. 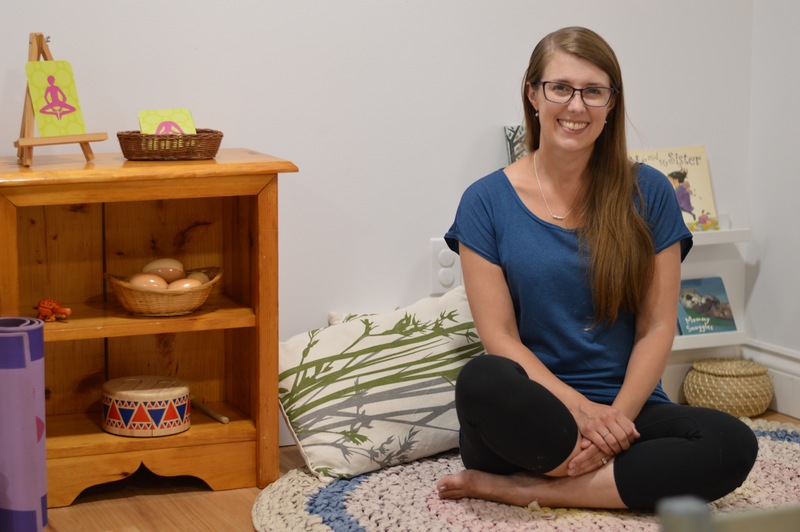 She trained in Toronto and saw a need in this rural/urban community for a Nido. She currently guides six children that range in age from 14 months to 3 years. She welcomed us in with little notice and graciously let us explore her environment. 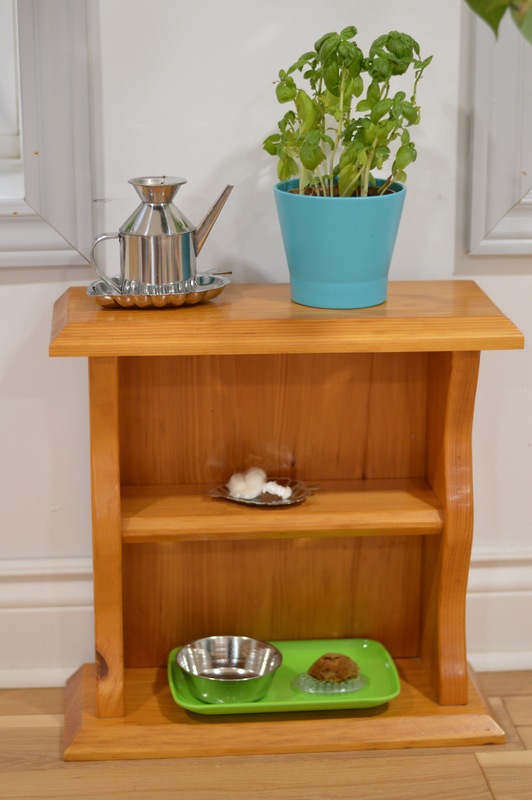 She chose to have everything from the shelves to the tiny chairs custom made to ensure they were at the correct height and the attention to detail does not go unnoticed. Did you notice the culturally diverse books in the reading corner and the bird viewing area prepared in the middle window above? I did. It’s these kind of details that set this space apart in my mind. That meet and surpass that high bar. And it’s these kinds of intangible details families ought to be looking for when they are touring Montessori classrooms. Is the space filled with natural light? Is there thought and design aesthetic in the furniture, the seating areas? Are the large materials truly the right size for the children that are using them or are they just cut down versions? Most importantly, does the environment call to the child. If it does, a child regardless of age should run to the shelves and become sucked in by the beauty of the Prepared Environment. It was an absolute pleasure observing this space. If you want to know more about Alison’s work you can find it here on her website or follow along with her Instagram account here. I have always advocated for the belief that it is not the “stuff” but the experiences that are important to a child. A song sung by a loved one is just as stimulating as any gadget to a baby. However, I’m asked on occasion for ideas of Montessori inspired infant materials, so I thought I’d share a few. At a basic level you are looking for something that will delight the child, but many would be surprised where that delight can come from. 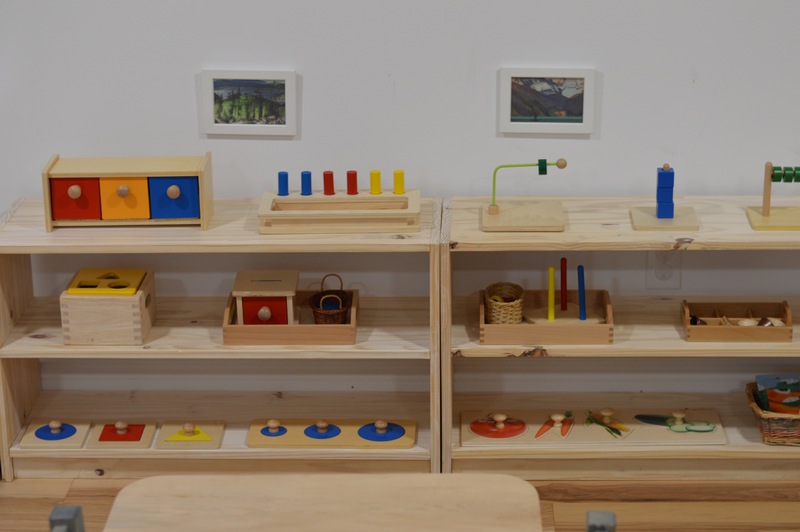 From a Montessori perspective, the items would ideally be made of natural materials. 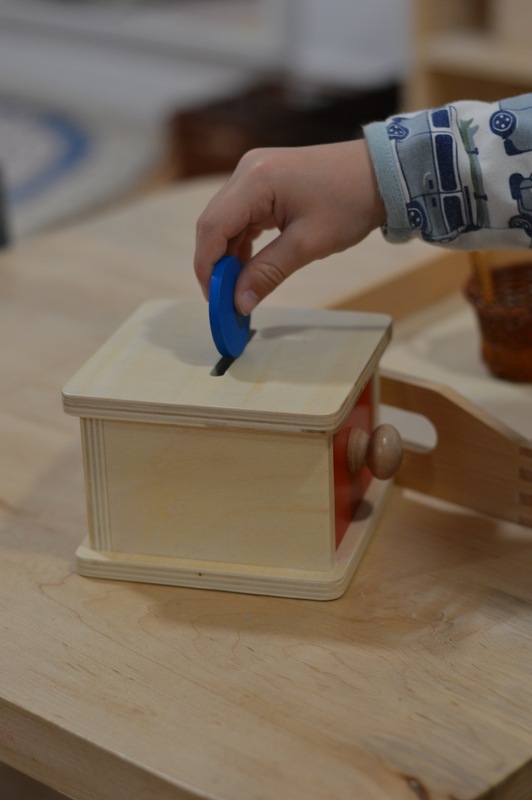 This gives the child an accurate sensorial experience. Wood feels very different from wicker and cotton very different from steel, but all plastic feels the same. Loud sounds and bright lights offer little in the way of concentration and often overwhelm or overstimulate. 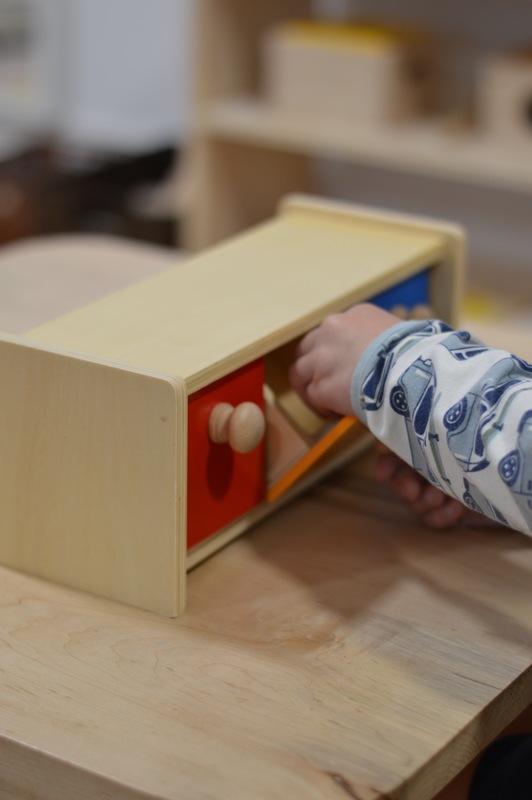 In the very early months, mobiles and mirrors that an infant can concentrate on are often all that is required for “toys”. I love mobiles. 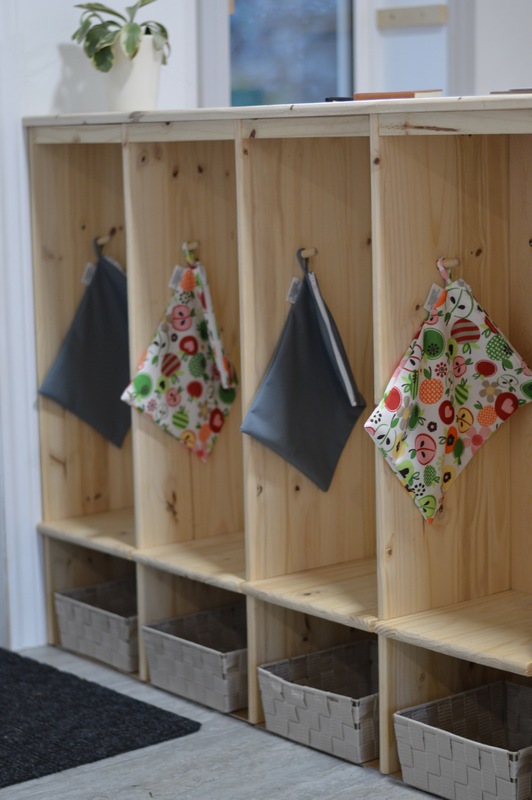 There are a series of Montessori Infant Mobiles that can easily be made/bought, but it takes very little time to attach some items to a base and hang it from the ceiling. I made the above mobile by cutting out circles from some pretty paper I had and then stringing them into chains and hung it from a ring. 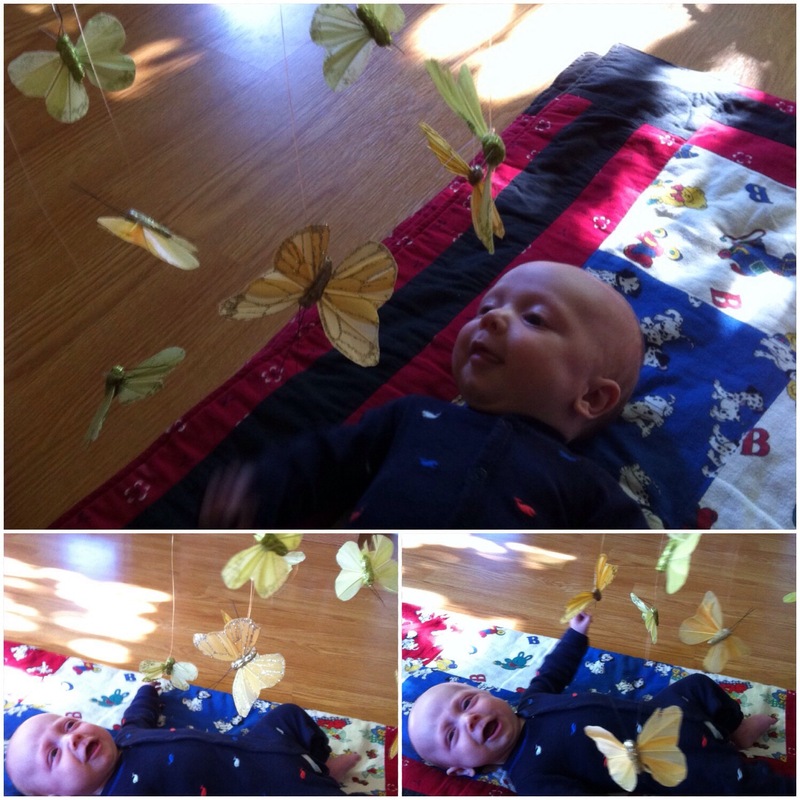 This is not one of the Montessori mobiles, but is simple, beautiful and allows him to concentrate. 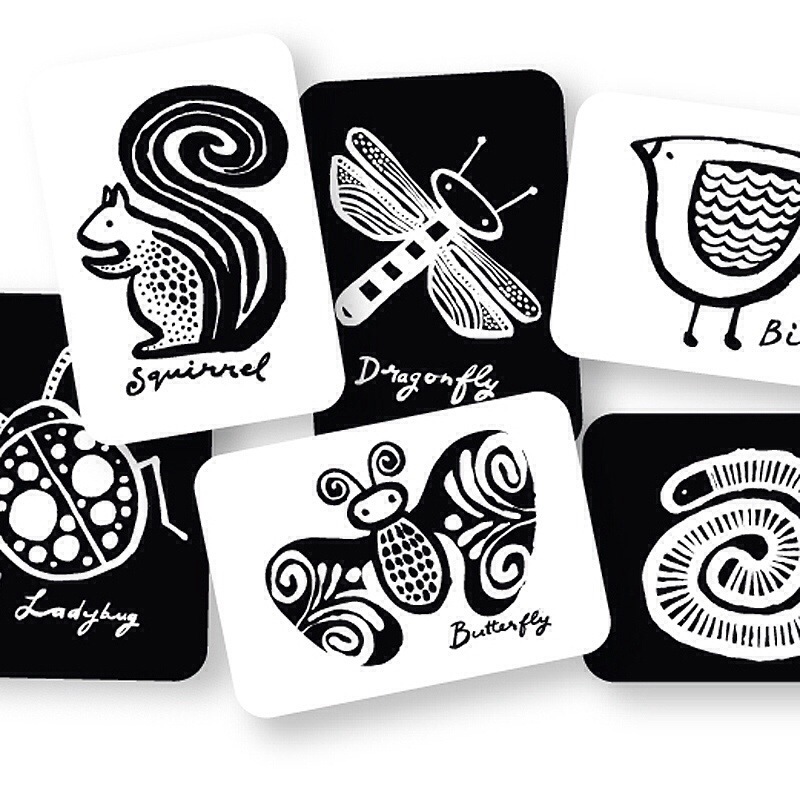 Wee Gallery Art Cards. 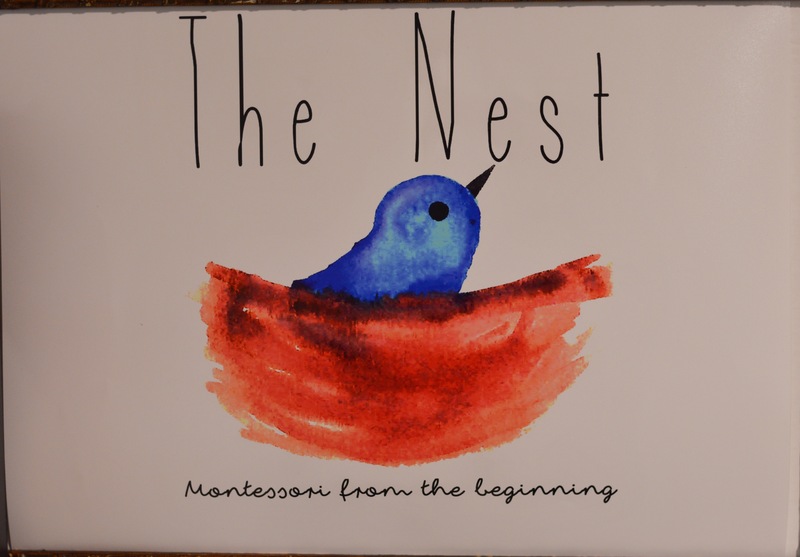 There are also many beautiful Montessori inspired options on Etsy. In the background on Quentin’s first low shelves are some “Treasure Baskets”. 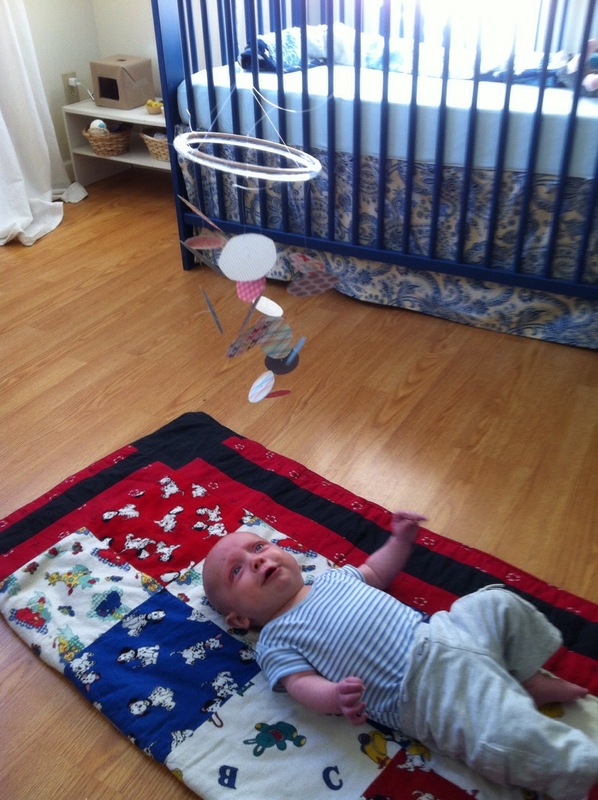 When the child is more mobile, they love looking at, grabbing, mouthing, listening to items in a treasure basket. Both Deb and Kylie have great ideas for treasure baskets for young infants. Even at this age a child has a strong sense of order. Baskets are usually kept to a single idea. You can put anything in them. 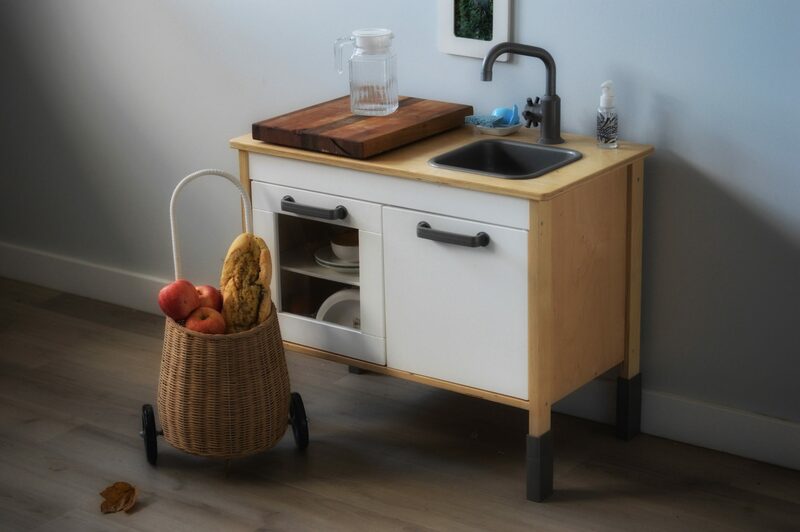 A kitchen basket may have a spatula, flipper and whisk. Or maybe sounds. Or colours. The possibilities are truly endless. 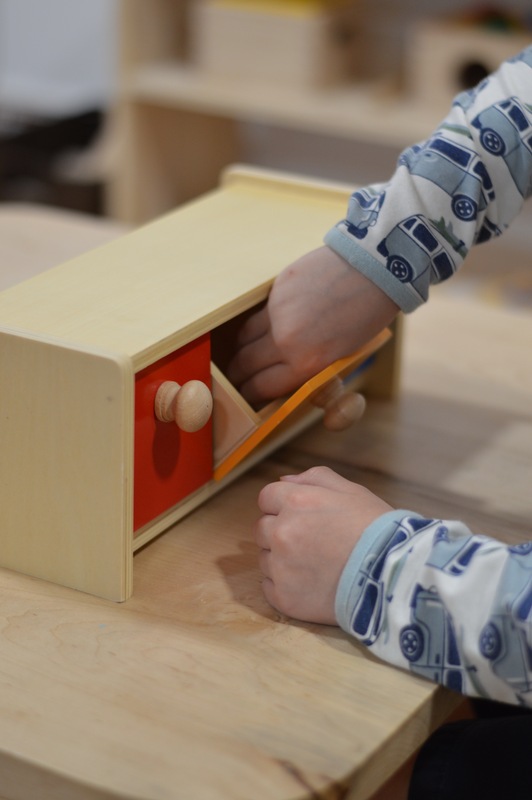 The brown box on Quentin’s shelves is a homemade Object Permanence Box. I made it out of a square post office mailing box and covered it with kraft paper. I made three: a large round hole and ball, a small round hole and cylinder shaped block and a small square hole and square block. These are a great challenge for older infants. He used them right up until just after his first birthday. These were his first materials. We supplemented these with lots of books and music and outdoor time. Looking back a year later, it went so quickly. It’s often a huge stress for parents to provide the “right toys for optimal development”. I think what’s important to focus on instead is providing quiet uninterrupted time for the child to concentrate and explore their world.